Minor rubbing. Two ink marks to bottom page-edge. VG. 23x15cm, xi, 235 pp., PAPERBACK. 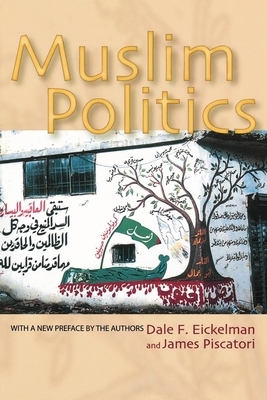 "In an attempt to demystify "Muslim politics" for a wide audience, Dale Eickelman and James Piscatori explore how the politics of Islam play out in the daily lives of Muslims throughout the world. From the role of women in public life to Islamic perspectives on modernisation and free speech, the authors probe the diversity of the contemporary Islamic experience, suggesting general trends and challenging popular Western notions of Islam as a monolithic movement. In so doing, they clarify concepts such as tradition, authority, ethnicity, protest, and symbolic space, notions that are crucial to an in-depth understanding of ongoing political events. This book poses questions about ideological politics in a variety of transnational and regional settings throughout the Muslim world. Europe and North America, for example, have become active Muslim centres, profoundly influencing trends in the Middle East, Africa, Central Asia, and South and South-east Asia. The authors examine the long-term cultural and political implications of this transnational shift as an emerging generation of Muslims, often the products of secular schooling, begin to reshape politics and society-sometimes in defiance of state authorities. Scholars, mothers, government leaders, and musicians are a few of the prota-gonists who, invoking shared Islamic symbols, try to re-configure the boundaries of civic debate and public life. These symbolic politics explain why political actions are recognizably Muslim, and why "Islam" makes a difference in determining the politics of a broad swath of the. 1996. Princeton University. Softback. Book-VG. 9x6. 235pp. Some b/w illus. NEW. 9780691120539 This listing is a new book, a title currently in-print which we order directly and immediately from the publisher. For all enquiries, please contact Herb Tandree Philosophy Books directly-customer service is our primary goal.